I love Prince. My first job was at a movie theater that played Purple Rain for months. I saw that movie hundreds of times, in five-minute bursts while I left the ticket booth unattended. My first concert was the Purple Rain tour – at the Capital Centre, outside of Washington, DC; one of the first albums I bought with my own money was Dirty Mind, on cassette, no less. I love Prince because he was the Everyman. His music encompassed every genre and followed me through all of my youthful phases – punk, hippie, metal. He was the only musician who, no matter how diverse the people at a party, no one ever complained when I put five Prince CDs on random play. It may seem like a big leap from filling a prescription and using doctor-approved medicine to facing dependence and addiction, but millions of Americans are addicted to opioids, many of which are prescribed by doctors, and tens of thousands die from opioid overdoses each year. Now, sadly, because of Prince’s death, I’m facing another first – someone I love has been felled by opioid use. 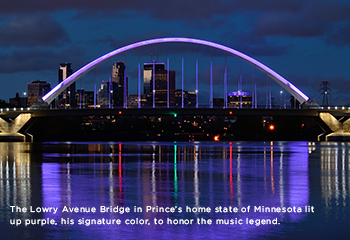 The facts as we know them – evidence in his home and studio of opioid use at the time of his death – point to the cause of Prince’s death at 57 as an opioid overdose. I’m mad, sad, gutted, and so bewildered about an all-too regularly occurring cycle that ended the life of someone I feel like I’ve known my whole life. Prince’s death has taught me an important lesson about my own preconceived notions. I’ve read over and over about the “opioid epidemic” and thought I understood it. With all of that reading, I did learn that the risk of opioid overdose skyrockets in middle age, but it wasn’t until Prince’s death that I realized much of my “learning” was academic. Like many people, I still held on to the notion that someone with a drug problem is someone who parties, is young, does drugs to get high. This time it’s different. Prince used medication to alleviate pain and didn’t use it for fun. Like a growing number of middle-age Americans, he was taking a series of drugs to alleviate chronic pain, increasing the risk of overdose. We can only really help when we put aside our judgments and allow our friends and family to speak honestly and really HEAR what they need. How does something like this happen? Prince was in pain after hip surgery, and most likely, he started out with pain medication prescribed by a doctor. It may seem like a big leap from filling a prescription and using doctor-approved medicine to facing dependence and addiction, but millions of Americans are addicted to opioids, many of which are prescribed by doctors, and tens of thousands die from opioid overdoses each year. Someone in Prince’s inner circle made a move toward getting him treatment, it seems. A representative from a recovery facility was on hand at Paisley Park when Prince’s body was discovered, but arrived too late to make a difference. Even though (or maybe, especially because) Prince was well known to live such a clean lifestyle, the stigma of opioid addiction had help coming his way under cover of night. Prince puts a face well known and well loved on the opioid misuse issue. His story, which isn’t that different from the stories of people in all our communities, tasks each of us to rethink our preconceived notions of what someone who is drug-dependent looks like. We can all be more compassionate and less stigmatizing when we talk to, and about, those with substance use disorders (SUD). Given the national numbers, we each might know and even love someone with an SUD. We can only really help when we put aside our judgments and allow our friends and family to speak honestly and really HEAR what they need. In his death as in his life, Prince challenges me. I vow to talk more honestly about the issues surrounding opiate use – with my friends, family, doctors, and legislators. Now that we all know someone who died from opioids, we can’t be silent anymore. This was a very good reflection on opiates without stigmatizing the addiction and without glamorizing Prince. Addiction happens to common people in our lives. Great article, very well written. I hope this will be an eye opener for many. Originally from FL, I know several folks who died from an overdose of opioids, prescribed by PM providers. I am not sure that we will ever win this war, but we are getting close on some of the smaller hills to the battle, leading to the war. Hopefully we will see a difference in our lifetime. Addiction definitely does not discriminate. Thank you Laura ~ Your reflection and honesty just punched another hole in the wall of stigma. You’re absolutely right, many of us do hold preconceived notions about individuals who abuse drugs….. Still there are perhaps individuals within Princes’ camp with often heard reframe “only if I could’ve, would I.” Stigma in all its ugly forms are as much to blame for the icon’s death as the drugs….